Elizabeth Clendining and Jennifer Chang, directors. 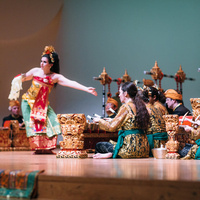 The Wake Forest University gamelan (percussion orchestra), Gamelan Giri Murti, performs traditional, neotraditional, and avant garde music, dance, and theater rooted in both sacred and secular traditions of Bali, Indonesia. The ensemble is open to all Wake Forest students, faculty, and staff, as well as the greater Winston-Salem community--no prior experience required, but curious minds encouraged. The Wake Forest University Chinese ensemble is devoted to performing traditional and contemporary Chinese chamber and orchestral works. The ensemble is open to student musicians who have already had some study of guzheng, pipa, erhu, dizi, traditional percussion, and beyond.